Transmethylation: SAMe donates a methyl group to a wide variety of substrates including DNA, proteins, neurotransmitters and phospholipids. Transsulfuration: SAMe is converted to cysteine; precursor of glutathione, major cellular antioxidant and liver detoxification agent. 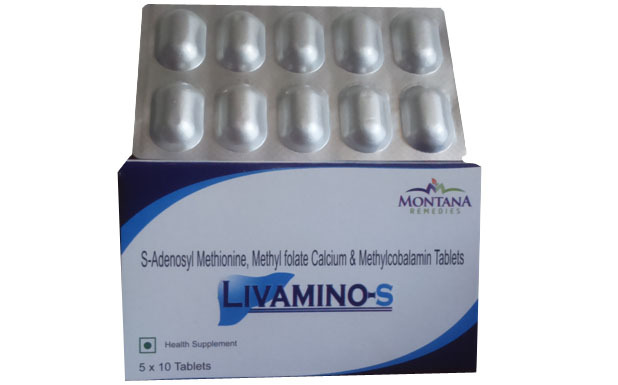 It is an essential compound which plays a major role in protecting hepatocytes (liver cells) from waste products that the liver removes from the blood stream. Maintaining adequate levels of SAMe is therefore critical for healthy liver function. It also stimulates synthesis of the proteoglycans used for cartilage regeneration. Polyamine Synthesis/Aminopropylation:SAMe is involved in synthesis of the polyamines through the aminopropylation pathway. These have anti-inflammatory and analgesic effect. Polyamines are involved in regulation of cell growth. 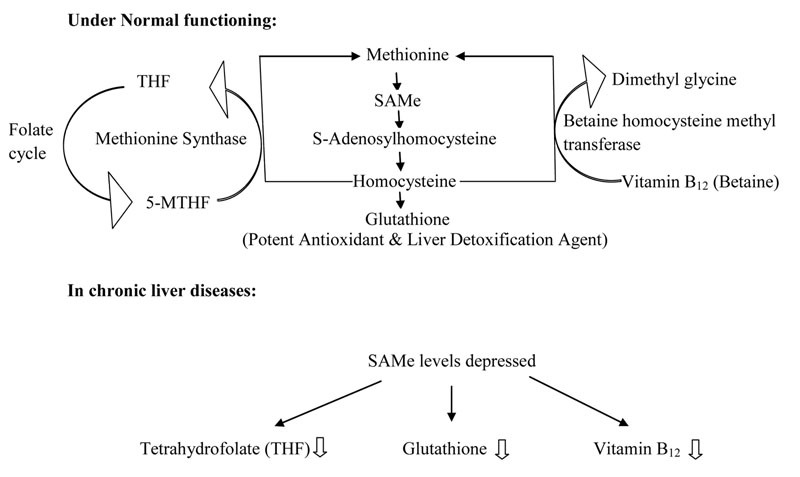 Individuals with liver cirrhosis have difficulty synthesizing the substance S-adenosylmethionine (SAMe) from the amino acid methionine. For this reason, supplemental SAMe has been tried as a treatment for cirrhosis. Here this combination comes into action by replenishing low levels of SAMe, 5-Methyltetrahydrofolate (Active form of tetrahydrofolate) and Methylcobalamin (Active form of Vitamin B12) and may help the body resume its normal function. Healthy levels of SAMe can help maintain healthy liver function. This combination is also useful in ageing; as people age SAMe levels can decrease. This can potentially cause important Liver protecting processes to slow down, or stop performing sufficiently. ● There are more than 100 clinical studies have been conducted, it has been proven that SAMe has clear benefits in Liver health and is safe for prolong use. ● Many Liver Physicians have been prescribing SAMe for their patients successfully for the past 10 years. ●	Large doses of SAMe may cause mania (abnormally elevated mood). Start at a low dose and gradually increase it. Do not exceed recommended doses. ●	Pregnant and breastfeeding women should not take SAMe. ●	People with bipolar disorder (manic depression) should not take SAMe since it may worsen manic episodes. Antidepressant medications: SAMe may interact with antidepressant medications, increasing the potential for side effects including headache, irregular or accelerated heart rate, anxiety, and restlessness, as well as the potential fatal condition called Serotonin Syndrome. Some experts theorize that taking SAMe increases the levels of serotonin in the brain, and many antidepressants do the same. The concern is that combining the two may result in a dangerous increase in serotonin levels. Talk to your doctor before using SAMe if you are taking any medications for depression or anxiety. Levodopa (L-dopa):SAMe may reduce the effectiveness of this medication for Parkinson's disease. Medications for diabetes:SAMe may reduce levels of blood sugar and may strengthen the effect of diabetes medications, which increases the risk of hypoglycemia (low blood sugar).